In an extremely crowded genre, it’s increasingly hard to design a game which stands out from the crowd so with the release of the Irish Eyes online slot from Nextgen Gaming we have another Irish legends-themed game to add to those already reviewed. It’s certainly colourful and comes complete with all the usual Irish cliches but is it any good? Read on to find out. 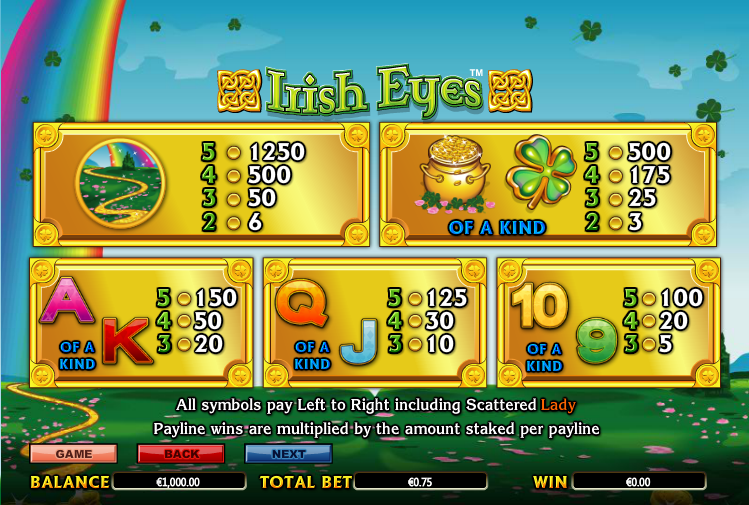 Irish Eyes is a slot which features five reels and twenty five paylines; the sound effects include Irish music and the reels are set against the background of a blue sky containing the end of a rainbow and clovers fluttering through the air. 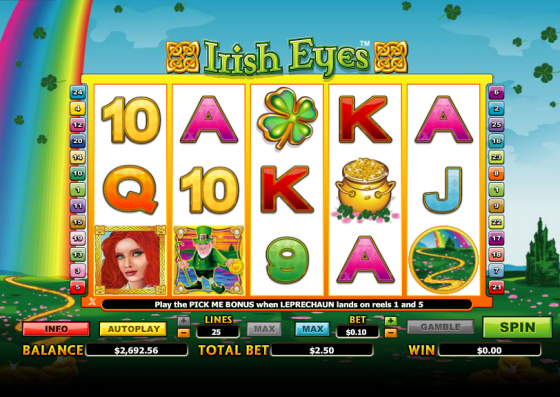 The red haired lady is the scatter symbol which triggers the free spins and there’s a little leprechaun wild which will reward you with 10000x your line bet if you can land five in a row. That red haired woman is the key to a generous twelve free spins and three or more of her on the reels will grant you those free goes. There’s no particular extras here (such as increased multipliers) but the spins can be re-triggered by landing more red haired ladies. The little green leprechaun is not just a handy wild, he’s also the key to this feature and to win it you’ll need to land him on reels one and five. You’ll be taken to a screen displaying a number of theme-specific objects and you get to pick to reveal coin amounts. You may also win chances to have more picks and it’s possible to trigger this feature from within the free spins round. If you’d like the chance to double or quadruple your most recent win then just click the ‘Gamble’ button underneath the reels after a win (the feature is unavailable during Autoplay). It’s a card prediction game so picking the correct colour wins you 2x your wager and the correct suit wins you 4x. Prize multiples are quite high in this game so if you can raise your stake a little it will pay off for you if your combinations land. You’ll also benefit more from the two bonus features if you can push the boat out a little. It’s fair to say that there are better Irish-themed slots out there but this is still fun in a simple kind of way; the various bonus features make up for the lack of graphical quality so if this theme is a favourite of yours, don’t miss out.